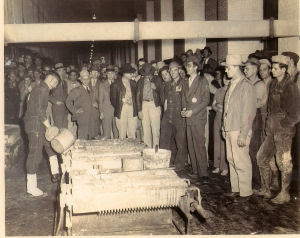 During the period between 1915-1941 many attempts were made to develop new production process of magnesium, especially in Europe. By the urgent need for magnesium created by the threat of the second world war, some of those procedures were employed on a large scale in England, Canada, United States with private funds andd governments. In the United States the DOW CHEMICAL COMPANY set up a plant in Texas that used as raw material sea water. In the manufacture of special refractories, and in the case of magnesia, whose reserves are currently insufficient, raw material comes in some countries (including USA) synthetic chemistry (magnesia obtained from the sea water and alumina from bauxite).